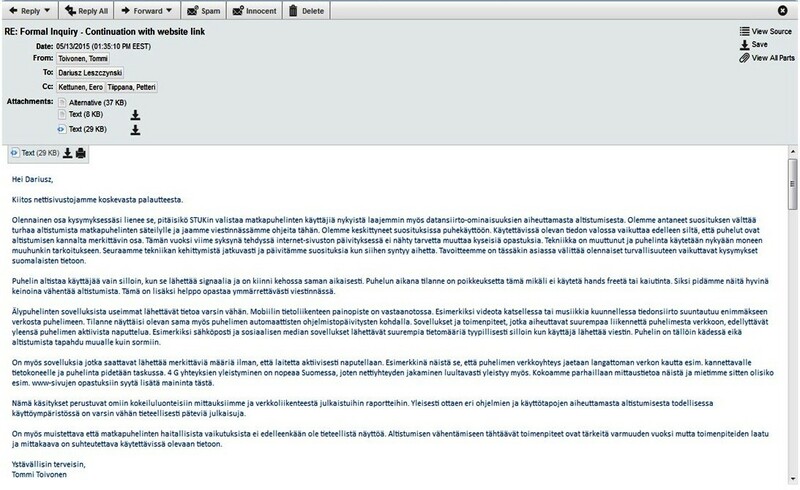 Finland’s STUK is hiding important radiation exposure information from the general public, the Government and the Parliament. What else is being hidden by the arbitrary decisions of STUK staff? How comprehensive and trustworthy is the information we, the general public, are provided by STUK? It is the time in Finland when the school year begins. Parents, especially of the first graders, often consider whether their child should have cell phone or not. The answer is commonly yes, because cell phone is a safety device – parents and children can reach each other in a case of emergency. After the issue of giving a cell phone to a child is resolved, the next problem arises – should it be the old fashioned cell phone or the smart phone? More and more often parents decide to give their children smart phone because it is not only a safety device but also, when used responsibly, an educational device. To convince us of the need for precautions, we need information, reliable and complete information about the current situation. The information helping us to make decisions, in the absence of clear messages from the authorities, is being actively hidden by the appropriate authorities, as e.g. STUK in Finland. A somewhat cautionary tale can be provided by our own smart phone’s battery. We often wonder that the battery needs frequent recharging. What is happening with all this energy “disappearing” rapidly from our battery? It does not vanish. It is emitted by your cell phone as radiation that is absorbed by some parts of our body… wherever is the pocket we keep our phone… It is already well known that “Many free Android apps are constantly pinging URLs, which could drain your battery…”. This energy, drained from the battery, is emitted as radiation during the pinging… and STUK experts should know it and warn about it. But STUK experts have chosen to not inform. Finland’s Radiation and Nuclear Safety Authority, known also as STUK, abbreviation derived from its Finnish name Säteilyturvakeskus, is a governmental organization responsible for assuring radiation safety in Finland. It provides expert advice to the Government, Parliamentarians, the industry and the general public about diverse issues associated with all types of radiation, radiation exposures, radiation use and radiation safety. All this seems to not get through to STUK experts. My messages hit the proverbial ‘brick wall’. In spring of 2015, I again viewed the website of STUK and noticed that the information concerning increased exposures from smart phones remains unchanged. STUK simply ignores the issue. At the same time STUK claims that it provides full information about the exposures and health risks. STUK is not giving any firm recommendations but just advice because science did not provide yet the conclusive proof of health risk. Instead of clear recommendations, STUK experts advise general public to make their own judgment based on the currently available information, provided by STUK. At the same time STUK does not inform about increased radiation exposures caused by smart phones. STUK is hiding an important part of the information needed to make decisions. Screenshot of the web page taken on August 10, 2015 still shows lack of any update concerning smart phones. How, the general public, is supposed to make own informed decisions when the radiation experts from STUK knowingly withhold important information about exposures? This is another untruthful statement from STUK experts, where they dismiss evidence, some of which came from STUK scientists, and which IARC considered as sufficiently compelling to classify cell phone radiation as a possible human carcinogen. It is possible to claim that there is no conclusive evidence, but the claim that there is no evidence is a simply a lie. Summa summarum, in respect to smart phones, on the contrary to their assurances, STUK experts hide important information from the general public, the Government and the Parliament. Hiding of the inconvenient to businesses information about risks of different radiation-emitting technologies gets a new context in, currently debated, building of a new nuclear power plant in Finland by Russia’s Rosatom, that will not only provide later uranium fuel but that also owns at least 34% of this nuclear power plant. How trustworthy will be the opinions that the Government, the Parliament and the general audience will receive from STUK? Technical know-how is there, at STUK, but the arbitrary decisions on what information should be revealed and what not, is another story. 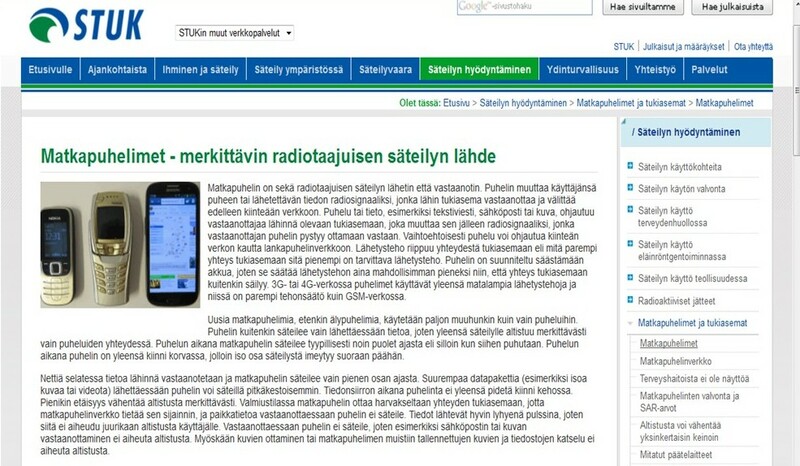 This entry was posted in Mobile phones and health and tagged apps, arbitrary, battery, battery draining, cell phone, cell phone radiation, children, commercial interests, Finland, government, Heikki Arola, Helsingin sanomat, hiding information, misinformation, misleading, Non-Ionizing Radiation Laboratory of STUK, nuclear energy, nuclear power plant, nuclear safety, parents, parliament, Radiation and Nuclear Safety Authority, radiation safety, Rosatom, Russia, safety, Säteilyturvakeskus, smart phone, STUK, Tommi Toivonen, trustworthy by dariuszleszczynski. Bookmark the permalink.